The ultima geek vs. marketing victim contest: should I get an Apple Macintosh ? Some folks seem to believe I should switch to a Macintosh! OK, maybe... not completely sold to the idea. So what should it be? 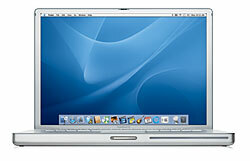 A super beefed-up dual-pro G5, or a slick powerbook 15"??? A list of must-have apps is also cool. Comment away folks, make the arguments roar! Final decision to be taken on November 30. PS: note that I have been visiting Apple stores lately, both in Tokyo and in Paris (the new Apple corner at the BHV).